Why the role of financial risk management may become even more critical as divorced couples face emotional, lifestyle, and financial stress and change. In both life and investing, it is common to believe that existing or recent facts will continue unabated well into the future. This tendency to extrapolate from the present into the future is known as recency bias. Investment advisors rely on answers to risk tolerance questionnaires to determine clients’ investment risk profiles, yet the answers are regularly influenced and distorted by recency bias. Similarly, in addition to how one chooses to invest, recency bias can impact that person’s approach to financial and estate planning. For example, we expect that the people who are most important in our lives will remain so forever. Unfortunately, marriage, which represents the strongest and most intimate of human relationships, all too often ends in divorce. Although we all know about high divorce rates, most of us believe we will defy the odds when we walk down the aisle. Furthermore, very few investors plan for it, and many are blindsided by it. Conditions that exist in the short term rarely continue to the same degree in the future. Recency bias seduces us, but it also hurts us, both as financial advisors and as investors. Nothing stays the same. The priorities and actions of a new generation, or a new investment landscape or geopolitical order, can be vastly different from its immediate predecessor. When we create financial plans and allocate investment portfolios for clients, we should question our own recency biases and expect and plan for things to change. Advisors not only need to appropriately make investment provisions for black swans to surface at some point in the markets and the economy, but to also recognize that “gray swans” can appear in almost all aspects of a client’s life. Individuals cannot fully control their health or the likelihood of an accident. Therefore, it is only reasonable for a financial plan to make use of various insurance policies to minimize or ameliorate these risks. Financial planning by definition means being proactive and addressing what could change and what could go wrong. This can be reasonably well achieved when risks can be insured away. But it is not so easily resolved when the risk is beyond the scope of an insurance policy, such as in the case of the financial impact of divorce. According the U.S. Census Bureau (American Community Survey, 2015), about 21% of the “ever-married” adult population are divorced or separated. Because divorce results in the maintenance of two households where there previously was one, there is almost always a decline in the standard of living for the family. Not only do expenses escalate, but total net income generally suffers. In fact, for families that were not classified as lower income before the divorce, the drop in total income can be as much as 50%, says a study conducted by Utah State University. The study notes, “Researchers estimate divorcing individuals would need more than a 30% increase in income, on average, to maintain the same standard of living they had prior to their divorce.” These researchers also found that most children live with their mothers after divorce, resulting in most of the financial burden associated with child rearing falling on women. About one in five women, they say, falls into poverty as a result of divorce. Financial advisors who advocate for active financial management seek opportunities to help individuals who are experiencing changes in life circumstances where money is in motion. Divorce is the quintessential embodiment of these characteristics. Yet, very few advisors even remotely address the financial impact of divorce as part of a comprehensive financial plan, and only a very select minority specializes in divorce financial planning or is certified in this area. This is a missed opportunity for advisors and a potential threat to clients’ overall financial health. Although much of divorce financial planning takes place after the couple decides to separate, there are several issues that should be recognized when helping even happily married couples with their financial planning. Couples should be made aware that gifts and inheritances made solely in one spouse’s name are not considered marital property unless they are commingled with other marital assets. As such, noncommingled gifts and inheritances are not subject to division in divorce. Irrespective of whether a presently happily married spouse decides to share and commingle his or her gift or inheritance, he or she should at least be educated as to the financial ramifications. Similarly, although it might be uncomfortable for an engaged individual to request a prenuptial agreement from his or her soon-to-be spouse, particularly where individuals have accumulated significant assets prior to the marriage, I always recommend at least creating an inventory and market valuation of the premarital assets, and having the parties agree to such terms. This is especially important in second or third marriages, or where one spouse has owned an ongoing business enterprise prior to the marriage. Business ownership and valuation are aspects that most commonly complicate reaching a divorce settlement. Requiring a valuation of a closely held business often results in escalated legal and accounting fees, time delays, and a great deal of frustration and acrimony among the parties. As challenging and expensive as it is to value a business based on present conditions, imagine how much more is involved in trying to reconstruct a premarital value from many years ago. Agreeing to a number before marriage alleviates this time, expense, and frustration. In addition to premarital assets and other financial commitments, children (and their support and maintenance) are often cited as reasons why divorce financial awareness and planning are so much more profound for second or third marriages. In any event, once divorced, the propensity for a subsequent divorce grows exponentially. 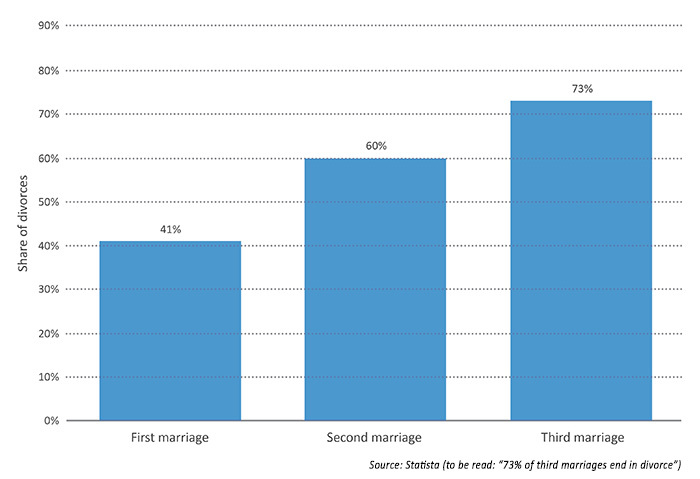 Mark Banschick, author of “The Intelligent Divorce,” estimates that close to two-thirds of second marriages and 73% of third marriages end in divorce (Figure 1). Whether resulting from remarriage or otherwise, it is of significance to note that baby boomers age 50 and over represent the largest cohort of divorcees today. This trend of older baby boomers boosting divorce statistics has become so widespread that the phenomenon has come to be known as the “gray divorce” due to the color of their hair. 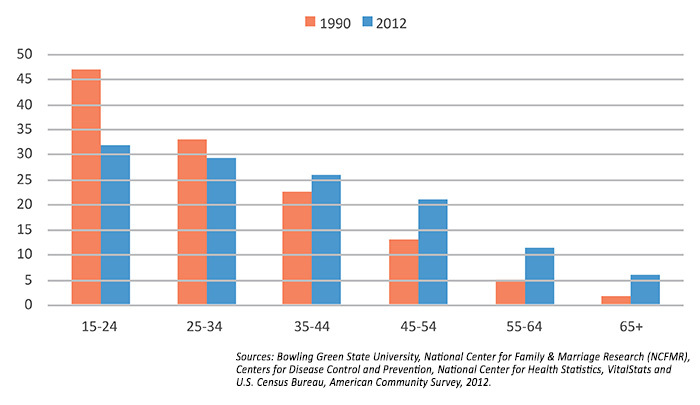 Evidencing the magnitude of this trend, Bowling Green State University’s National Center for Family & Marriage Research found that the divorce rate for those ages 55 to 64 more than doubled from 1990 to 2012, while divorces for the over-65 crowd tripled (Figure 2). For all of these reasons, divorce should never be completely ruled out in financial planning, even for long-term and established marriages. There are numerous justifications for active investment management. Most relate to overcoming recency bias and minimizing tail risks and black swan events and their effects on drawdowns. With such staggering statistics around divorce rates, an investment advisor should treat divorce itself as a tail risk and black swan event—or at least a “gray swan” event. The prudent advisor should consider the associated costs of divorce proceedings and their fallout, and diminished economies of scale, when providing comprehensive financial management for a married couple. An investment advisor should always seek to reduce the risk of any significant loss resulting from investment performance, but this is especially critical for any party that becomes entangled in divorce. 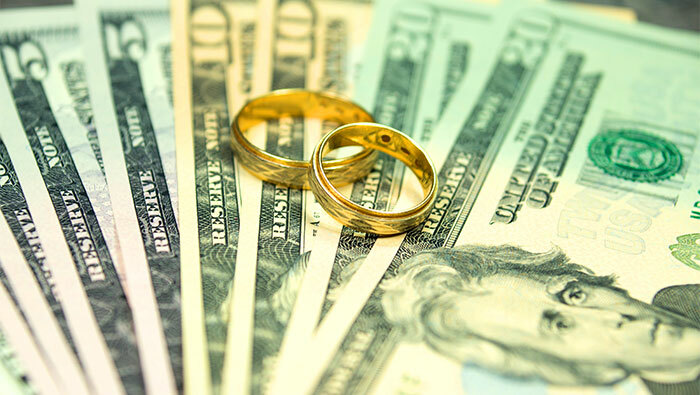 The “sequence of returns” issue, frequently considered in retirement planning, is also a potentially major issue in the case of divorce settlements. There are other reasons why active investment management is particularly pertinent in divorce. While all the financial aspects previously discussed here have addressed the negative consequences of divorce, I have experienced a notable positive financial outcome in dealing with clients going through divorce. This positive outcome aligns perfectly with the rationale for active investment management. The cases that come to mind are those where, as happens commonly, the majority of a couple’s investable assets, outside of real estate, are in a spouse’s 401(k) plan. Because most 401(k) plans limit the asset categories to long-only stock and bond funds, these plans are the antithesis of active investment management. In the vast majority of 401(k) plans, the participant can only experience gains when either stocks or bonds advance. There are generally very few safeguards that plan participants can use to mitigate risk or prevent significant drawdowns, outside of basic diversification or choosing cash allocations. Plan participants are also seldom offered the opportunity to use strategies that can see gains when markets are declining. Tail risk and black swan events cannot be remedied in a traditional 401(k) plan. Fortunately, many more retirement plans today are offering participants the opportunity to carve out a self-directed 401(k) or 403(b) investment option where professional money management and active management might be employed. However, awareness of this option is far too low among both plan participants and even their financial advisors, and, of course, not all retirement plans offer this choice. While married, the nonparticipant spouse has no control over the allocation of his or her spouse’s traditional 401(k). Nor does he or she typically have available the benefits of active investment management. Upon divorce, the spouse’s marital share of a 401(k) can be rolled over into a self-directed IRA. Not only does a rollover IRA detach the spouse from being entangled in his or her ex-spouse’s retirement plan and selections within it, but it also more directly opens the possibility for independent financial advice and active investment management. He or she can now gain access to (1) tactical investment management and quantitatively-driven strategies, (2) asset classes and strategies that are not as highly correlated with the market as traditional long-only strategies, and (3) greater opportunities to hedge against market drawdowns. Divorce is not only prevalent, but it is increasing for an older segment of the population with greater net worth and investable assets. It is a complex area because it touches on almost every segment of law, taxes, and estate and investment planning. For all of these reasons, an investment advisor should either commit to specializing and practicing in this area—fully understanding the potential financial impact of divorce—or team up to collaborate with someone who does. The opinions expressed in this article are those of the author and do not necessarily represent the views of Proactive Advisor Magazine or LPL Financial. This material is for general information only and is not intended to provide speciﬁc advice or recommendations for any individual.